Just three months before, Catherine had suffered a miscarriage, and now her doctor was giving her that heart-breaking news for the second time. The doctor advised Catherine to abort one of the twins to give the other a better chance of survival. Catherine refused and was sent home on bed rest. Catherine also sculpted a model of the baby she had miscarried. “It helped me to heal by honoring that life,” she said. Catherine’s twin boys were born healthy one week later. But even after she took her miracle babies home, she couldn’t stop thinking about that baby at the hospital. “It broke my heart to realize that at that time, that precious baby could have been aborted legally in New York, no questions asked,” Catherine said. Catherine’s unique ministry, which she calls “God’s Little Ones,” had begun. Catherine’s models have been on display at the fund-raising banquet for her local pregnancy resource center, and they have even been commissioned to prove personhood in a court of law. “I don’t know the details of the cases, but several times, I’ve created a model to represent an actual baby in a court case,” she said. An Inuit tribe in Canada ordered 1,800 of Catherine’s dolls for an educational program to teach pregnant women about fetal development and the dangers of drinking alcohol while pregnant. A doctor took several of her dolls to Africa to teach mothers of premature babies about kangaroo care. A film crew from South Korea made a movie about Catherine’s dolls, hoping to prevent abortions in their country. 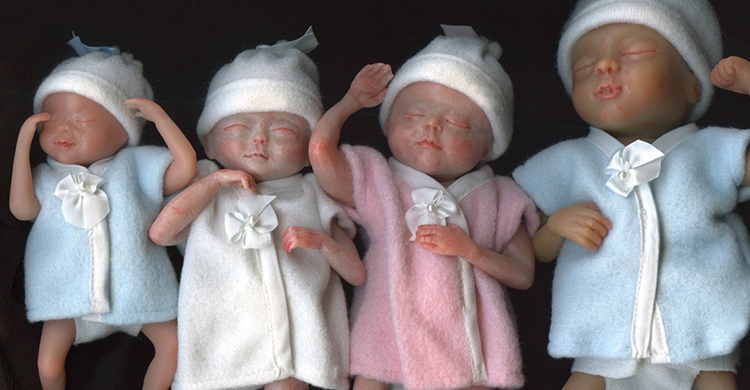 Over the last 23 years, Catherine has made more than 5,000 dolls at various gestational ages. They have been used as dolls to help parents heal from miscarriage and abortion, as models to educate in prenatal and pro-life settings, and they even saved a life. Catherine’s greatest desire is to get her models into the public schools. “I created them to teach my own daughters what their baby brothers looked like in the womb, and now, I want all children to see the miracle of life,” she said.